The ordnance flaming shell device was a generic insignia used in a number of contexts. Many surviving artifacts were originally made as coat-skirt ornaments, worn on the back of tailed coats, which by the time of the Civil War had passed from fashion and regulation. 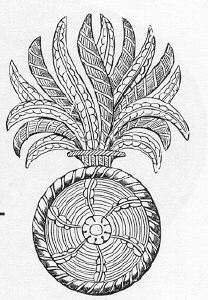 Coat-skirt flaming shell ornaments were commonly worn by artillery officers. The ordnance branch was small and original embroidered insignia are uncommon.